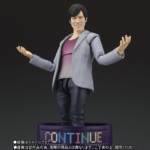 In a bid to create the ultimate game Zombie Chronicle, and restore the data of all those lost to the Bugster Virus, Kuroto Dan has obtained the power of god. Using the God Maximum Mighty X Gashat, Kuroto ascends to become Kamen Rider GenM God Maximum Gamer, Level Billion! And this unique S.H. Figuart has quite a a history to it. GenM Level Billion is an all new mold, and honestly a surprising release. It’s been a couple years since Ex-Aid aired, and despite this we’ve still yet to see a number of Ex-Aid’s forms in S.H. FIguarts. But Kuroto Dan’s massive popularity continues to drive new releases for him, including this one. A repaint of an Ex-Aid figure that actually has still yet to release! Level Billion is a big beefy, and surprisingly well articulated figure that shine’s with GenM’s personality. The included extra hands and Gashacon Key Slasher also compliment the figure nicely. We’ve attached the full gallery to this article. but you can also read our full review with this figure’s interesting background by clicking “Discuss on the TokuNation Forums” at the bottom of this post. Following up from what will for now be the last GenM gallery, next time we tackle his father, S.H. Figuarts Kamen Rider Cronus! The mighty Kuroto Dan has returned! Evil CEO turned Dangerous Zombie, now the one true Game Master has returned as Bugster! Revived thanks to Poppy the new Kuroto has 99 lives and all the time in the world to seek revenge on Kamen Rider Para-DX as well as his father Masamune. Back from the dead, this is our gallery & review of S.H. Figuarts Kamen Rider GenM Action Gamer Level 0! GenM has made a couple outings in this line as Level 2, Level X, and even Level Billion at this point, but Level 0 is the first one to truly cash in on Kuroto’s massive popularity. A very minor repaint of Level 2, Level 0 includes a ton of new accessories like the Bug Visor Zwei, a God Kuroto Dan effect sheet, Life Point Counters, and even a Gashacon Breaker Blade. Even as similar as they are, this release does a fantastic job of setting itself apart. But is it really worth those Tamashii Web Exclusive dollars? Check out our gallery & review to find out! The entire gallery is attached to this story, but you can also read our full review by clicking “Discuss on the TokuNaiton Forums” at the bottom of this post. Later this week we’re bringing Kuroto back one more time with a gallery of S.H. Figuarts Kamen Rider GenM God Maximum Gamer Level Billion!